Walker and Evers promise increased spending for roads and schools, but haven’t said how to pay for them. Tony Evers, the Democratic candidate for governor, taught science before he became a principal, school district administrator, deputy state superintendent of public instruction and, in 2009, was elected state superintendent. Republican Gov. Scott Walker worked in marketing and fundraising for the American Red Cross before starting his political career by winning a state Assembly seat at age 25. He is seeking a third four-year term. Those bios mean the one elected governor on Nov. 6 may need a refresher course on state government math, since both are making campaign-ending spending promises that amount to major liens on future state revenues. 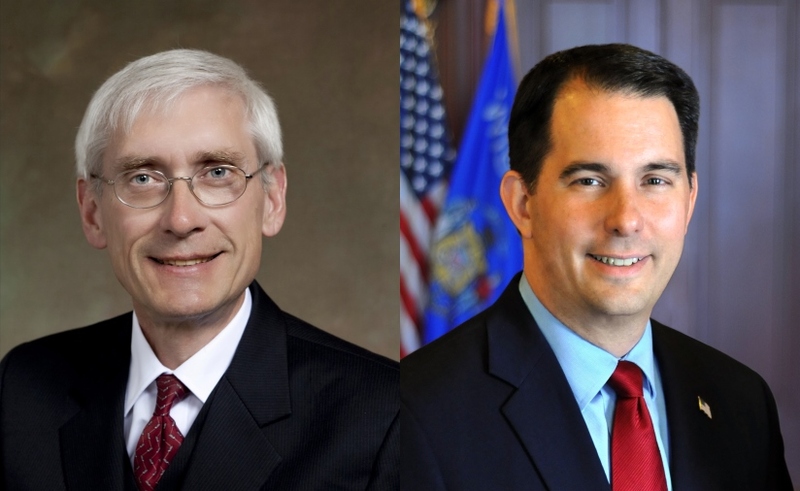 Walker and Evers may both be making wishlist spending promises, unless there is a tax increase or dramatic spending cuts. Here’s a pre-election primer on the fiscal facts the next governor faces when he takes office in January. *$900 million in IOUs – past spending commitments for the two-year 2019-21 budget cycle that start coming due after July 1. Topping the list of spending promises on that costs-to-continue list include the first installment of tax credits and tax breaks to Foxconn, if it can show it has met specific investment and hiring goals at its Mt. Pleasant manufacturing plant now under construction, according to the Legislative Fiscal Bureau. State general-fund tax collections totaled $16.14 billion last year – a healthy 4% one-year increase. If there is no recession, and tax collections went up by that much again this year, it would bring in $645 million more. And, the state treasury had a $588-million surplus on July 1. Two straight years of 4% growth in tax collections could easily absorb the $900 million in IOUs, if there was no other spending increases. But there are. *Medicaid: +$494 million. State Department of Health Services officials submitted a 2019-21 budget that would require $494 million more in state tax dollars by mid-2021. By that 2021 budget year, Medicaid is expected to cost a record $11 billion. State taxpayers pay about 31% of the cost of Medicaid, which provides health care to more than one in five Wisconsin residents. If elected, Evers said last week his first budget will propose applying for additional federal dollars to expand Medicaid, which he said could bring in “hundreds of millions of dollars” more to pay for the program. But it’s doubtful that Republicans, even if they only control the Assembly after Nov. 6 elections, will agree to apply for more federal aid to expand Medicaid. And, if the federal government agreed to the expansion, when would that additional cash start coming to Wisconsin? *K-12 school aids. Evers wants to boost state aid to K-12 schools by $1.4 billion, including $600 million more over the next two years to pay for special-education programs. In Friday’s debate, Evers said the $1.4-billion increase is needed to offset the $800 million cut in state K-12 aid that was part of Walker’s first budget. And both Walker and Evers want state government to return to paying two-thirds of the cost of the K-12 system – an increase the Legislative Fiscal Bureau estimates may cost an additional $130 million. *Cut income taxes? Evers said he will propose a $340-million “middle class” income tax cut, which would help individuals with taxable incomes of less than $100,000 and couples with taxable incomes of less than $150,000. About $300 million to pay for that tax cut would come from new income limits on who can qualify for the manufacturing and agriculture tax break – a tax break that will cost the state treasury $570 million in the current two-year budget. But Walker’s campaign said Evers will raise taxes overall. *State aid for local government roads. For his part, Walker has promised $110 million more in future state aid for county and town roads. Cash for state and local highways comes from the Transportation Fund, separate from state government’s main checkbook. Neither candidate has said how they will pay for highways, and pay down road-building debt, in the future. Walker promised to announce a plan by now, but didn’t. And Evers has said he won’t have one until Jan. 7, the day he is sworn in as governor.